<br>Bin eher enttäuscht von diesem Album. The weakest Panic! album to date, that being said it does have some cracking tunes like 'Victorious' and 'LA Devotee'. 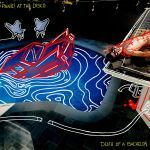 The album contains the usual wonderful musicianship from Urie, but the whole album feels too animated, like a soundtrack for a maniacal musical.